Medications alone don’t help smokers quit. The study, published online in the Journal of the National Cancer Institute on December 21, assessed the effectiveness of three first-line medications recommended by clinical practice guidelines: varenicline, bupropion and nicotine replacement therapy (patch). The data was collected from the Current Population Survey-Tobacco Use Supplement — a U.S. Census survey of adults 18 years or older conducted to obtain information about the country’s use of tobacco products. 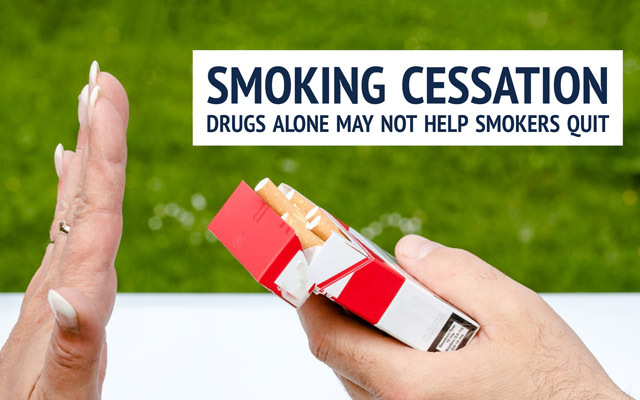 Studying two cohorts surveyed approximately one decade apart, the team used a method known as “matching” to help balance comparison groups on factors that could lead individuals to be more likely to use a cessation aid but simultaneously make it more difficult for them to quit. For example, one factor was the amount of cigarettes someone regularly consumed. Co-authors include: Tarik Benmarhnia, Martha M. White, Madison L. Noble, Dennis R. Trinidad and David R. Strong, all at UC San Diego. This research was funded, in part, by the Tobacco Related Disease Research Program (24ST-0050, 21RT-0135, 24RT-0036) and the National Heart, Lung and Blood Institute (T32HL007034).